While refinishing my roadside rescue dresser for the studio, I decided to change from the traditional waterfall bale pulls that came on the cabinet to something a bit more my style. You guessed it, farm girl french. I wanted the cabinet to have an older, more utilitarian, feel. 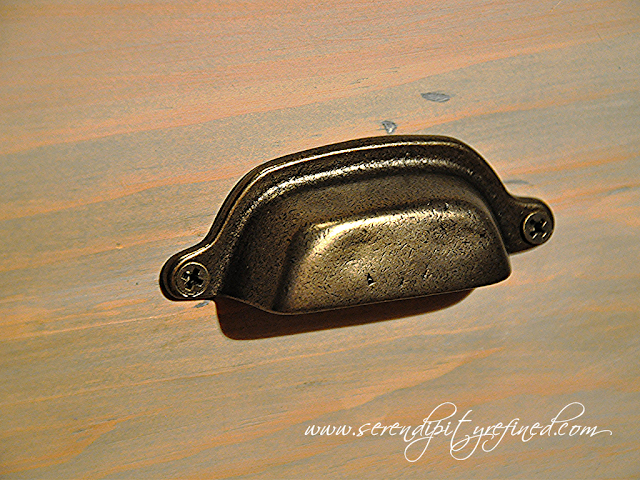 I chose Restoration Hardware Dakota 3/4 inch button knobs in rustic pewter for the smaller, top drawers on the cabinet. 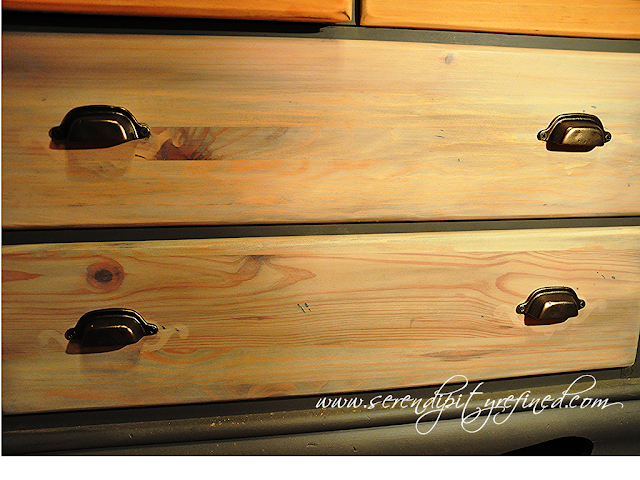 I chose Dakota cup pulls in the same finish for the larger drawers on the lower portions of the dresser as well as the drawers on the two book shelves that I also refinished for my studio. 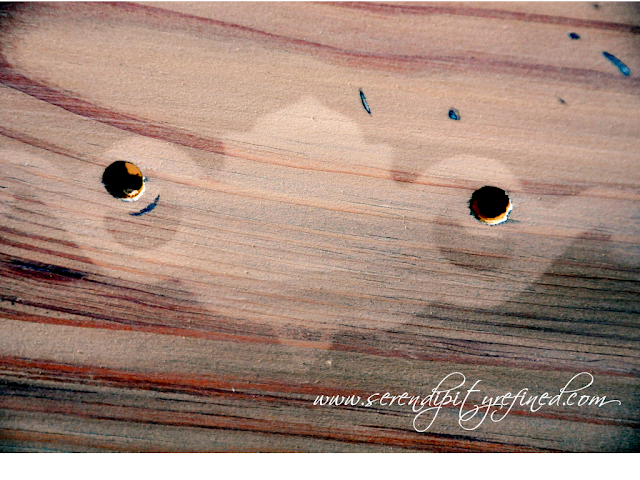 I was happy that RH had both 3 inch and 4 inch (spacing between the holes) sizes. After purchasing the hardware and bringing it home, I attempted to put it on the drawers. I realized that I had a problem when I began to screw in the first screw. 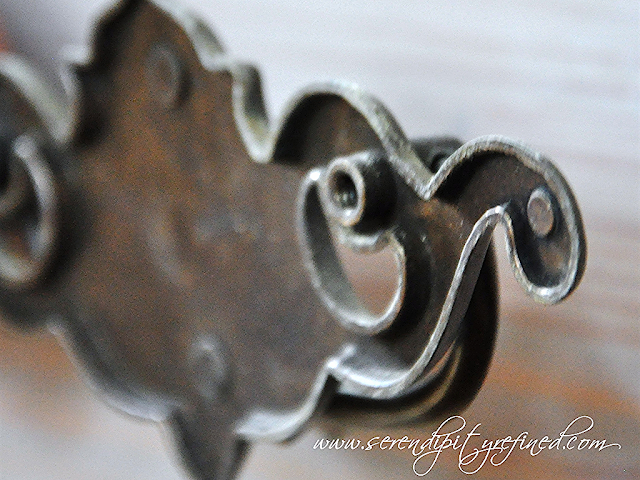 The issue: The old pulls were attached from behind through collars which were partially recessed into the drawer front.This meant that the holes were about 1/4 inch in diameter. Not like the tiny wood screws that came with the new pulls. Obviously, in order to be able to use the new hardware I either needed to fill the hole or to live with the hardware being slightly off center. Given my DIY OCD, having them off center wasn't gonna fly. I needed to fill the hole. I could have used wood putty but I didn't want to take the chance that it would crumble and/or fall out of the hole when I opened and closed what will most assuredly be heavy, overfilled, drawers. 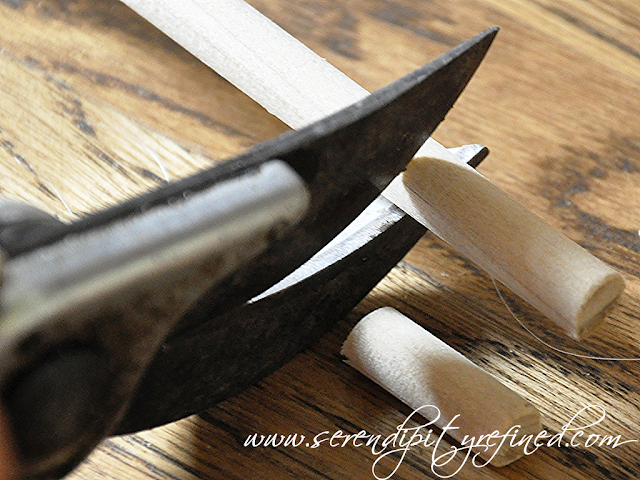 I talked it over with my friend, Ann and told her that I wanted to use dowels. She agreed that it was the best method to use for what I was trying to accomplish. 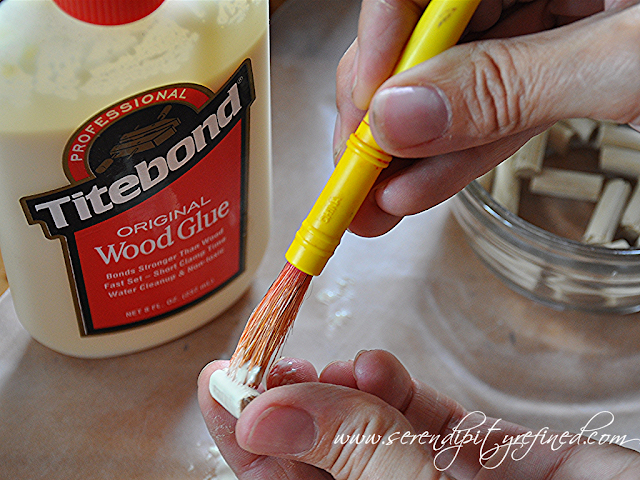 The process is actually pretty simple: cut the dowel using a saw (or, if you're lazy in a hurry to get it finished, use your pruners), paint the dowel with wood glue (or, skip the whole paint brush thing and just roll it in some glue which has been squeezed onto a piece of paper. 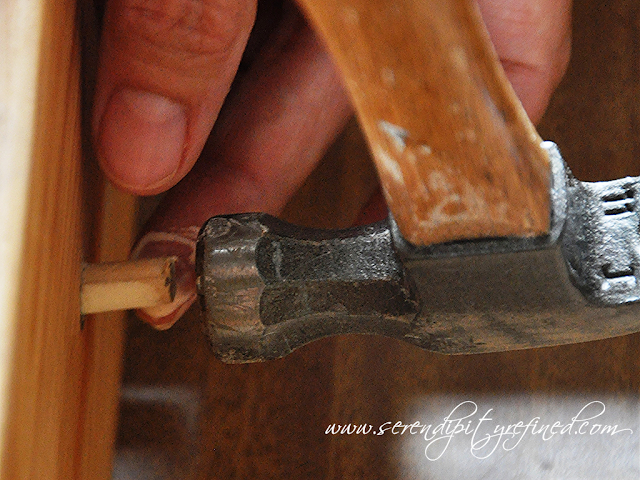 From the back of the drawer, hammer the dowel into the hole until it is just beneath the surface. 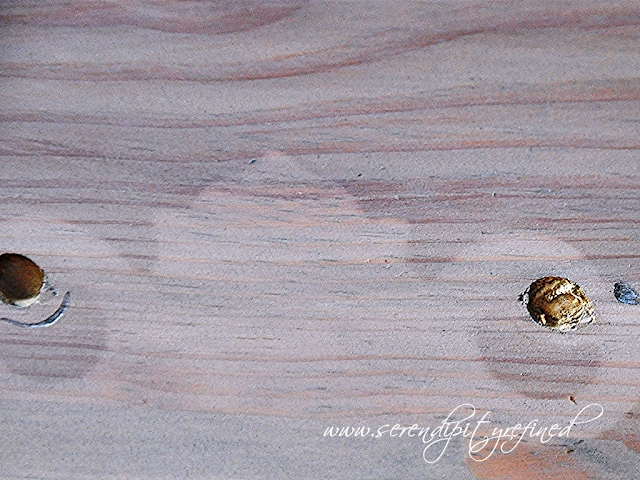 After the glue dries, you should drill a small pilot hole and then screw in the hardware. But, let's be honest here, shall we?! We all know that I didn't drill the pilot hole first, don't we?! Yeah, I'm a trouble maker. Rule breaker. That's me. Don't tell the hardware.